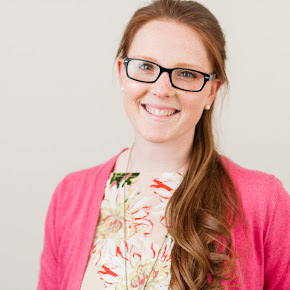 It's Monday and here I'm linking up with Cathie from With Coffee in Hand for another week of bashing my stash. But, it's not just me today joining her-there's a whole bunch of us! We're doing a blog hop so be sure to check out all the other blogs as well for more inspiration. One of my goals this month has been to kill a few kits and I've been working on it. I took out an old kit from The Paperie's monthly kit club and was determined to finish it off. Of course, I added a few things I had lying around as well. I wanted to try something new with this layout as well. Enter-stitching. Yes, I love Sasha Farina and that girl has mad skills for stitching on her layouts and I have been itching to try it. So I masked and misting and stitched. And then I added a photo I had lying around that was left over from my PL life layouts from January that didn't make the cut. I love that Amy tangerine chevron paper. It's what I used to punch my heart masks so I used it as a little accent as well. And of course you can't make a layout without washi tape. It's new but don't judge. I have little restraint when it comes to washi. 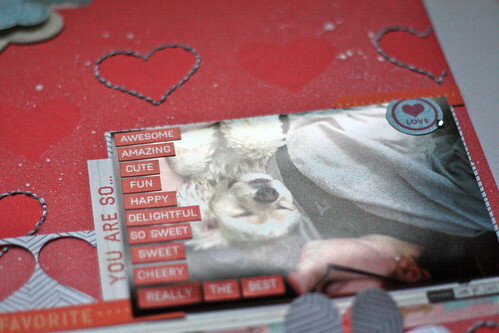 I used a whole bunch of little My Mind's Eye words on my pic as the journaling and left the title small. 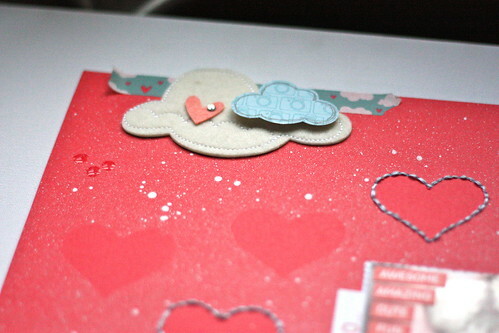 I added some more washi at the top of the page with a little felt cloud and punched another cloud for good measure. 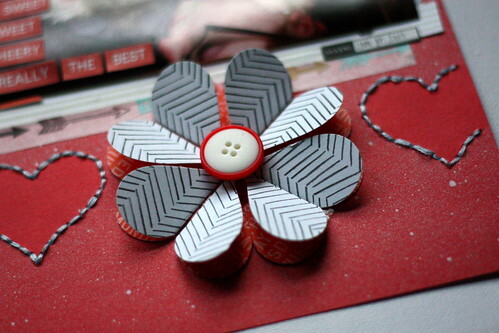 One of my favourite things though is this flower, made from folded hearts out of that lovely chevron paper. Learned this one on pinterest. What would we ever do without it?! And that's how I bashed my stash for this layout. I have one more layout on my table that I've used this kit for and then there's just scraps left of it. Now, go check out how these ladies bashed their stash. Next stop is my girl Liz. Check her out at Pieces of My Everyday Life. Krista love the colours the details and dimension. This is a Great LO!!! Beautiful LO krista! 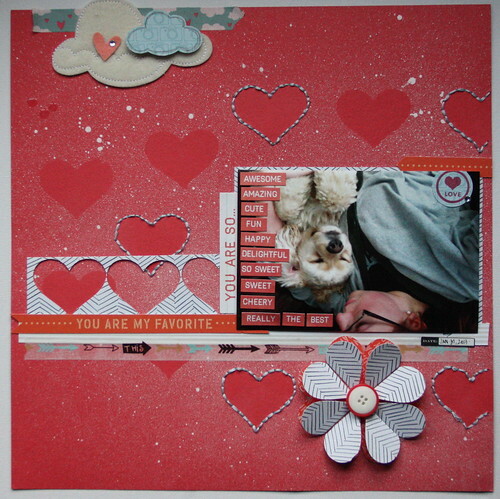 Love the misting,stitching and the flower made of hearts...plus a cute pic of you and Eugene! Great flower you made....how true that Pinterest is great! I like that you put all te descriptive words right on the photo!! I love all the details you put in your layout - so creative. I think you might need to teach a "kit killing" class soon. Love the misted hearts and how you added stitching. Love pinterest! This is just fabulous, and that pic is too much! Love how you added the stickers to the picture! Really awesome layout! I too am in love with Sasha's stitching skills and you did a great job on yours!! Love the stitching - awesome LO all around! 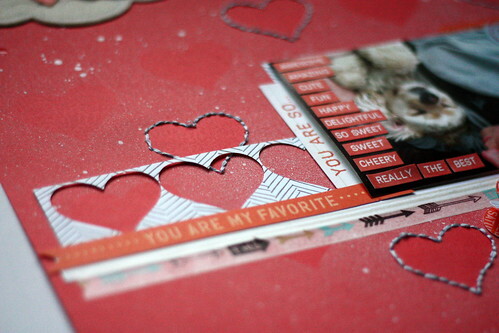 I love your misting and then stitching around the hearts! Gorgeous! Okay what everyone else said... Plus Eugene is adorable! I'm not a stalker, we met at the Spring Retreat last year... ;) love the stitching and the flower made from hearts... Will have to try that flower! Love the flower and the words directly on the photo - love the look. This is gorgeous! I love all the negative space from the hearts and the stitching is awesome.